Local October events, book recommendations for your children, and more! 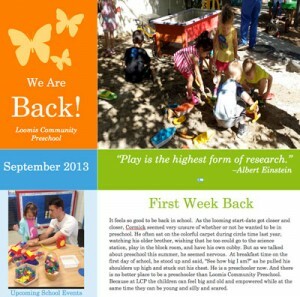 Check out this month’s Loomis Community Preschool Newsletter. One of the teachers at Loomis Community Preschool used to own a pet skunk. She’d even put it on a leash to take it on walks. Find out which teacher in the September Newsletter. There’s also a lot of non-skunk related info that you’ll enjoy.